Here at Artroom we have many pupils who come to our term-time courses term after term, but for one reason or another, they may never have attended one of our school holiday workshops. During each half-term course with our younger classes, we build a picture step-by-step, over a number of weeks. 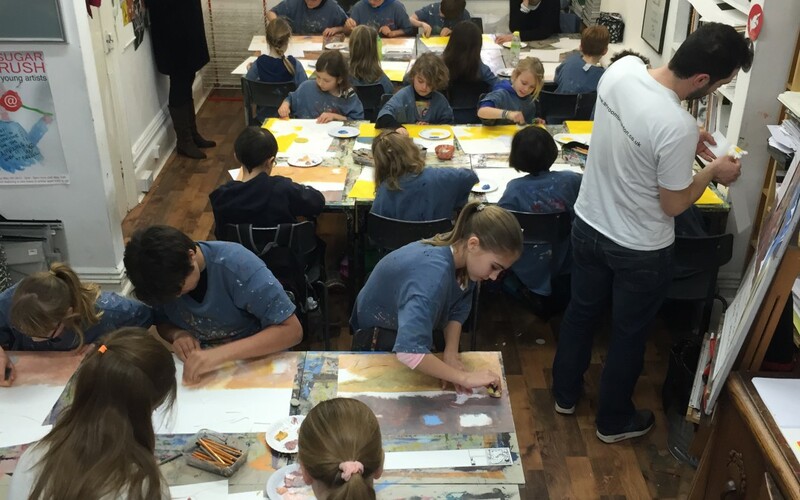 In an Artroom workshop, many of the principles we use with pupils to create their masterpieces are exactly the same. The only difference being that we do it all in one day! Of course, during term-time, pupils will work in their sketch books as well – something we don’t do in a holiday workshop – which is why we manage to complete our pictures in one sitting. So if you are considering enrolling your child or children on a holiday workshop, especially for the first time, you might like to know how a typical day breaks down. We ask parents to drop off their children shortly before 9am in the morning, usually about 5 to 10 minutes beforehand is ideal. Pupils are asked to bring a packed lunch with them, including a snack for midmorning break-time, and a drink. Once everyone has arrived, Seb will introduce himself and explain how the day will run. Next he will give a short introduction to the theme or artist we will be working in the style of, then after that we will begin work on our pictures! Artroom’s legendary version of “Pictionary”! The rules are simple: Seb will try to guess pupil’s drawings based on a letter of the alphabet, as they play against Keith or Jamie for prizes. You won’t be surprised, however, to hear that the pupils often win, as they are so talented (especially against Jamie)! There’s just time after a few rounds of Pictionary for some finishing touches to our pictures, before 3pm rolls around and it’s time to go home, with a great sense of accomplishment and a new piece of art to show awaiting parents and loved-ones. All-in-all an Artroom Workshop is a fun-packed experience for any child who loves art; hopefully one they will wish to repeat, in more holidays to come.